Casey ex Australia: We have found gravitational waves! If you were watching the news recently, you may have seen droves of excited scientists talking about a recent discovery of gravitational waves. This blog, written primarily for my readership/family, will talk a bit about it, as I was lucky enough to be involved, in a peripheral way, in this research. First, what are gravitational waves? If you were reading certain German language science journals in 1915 and 1916, you may have come across a series of papers by Albert Einstein laying out the foundations of what we now call General Relativity. Newton's observation that gravitational force is proportional to mass and inversely proportional to distance is 99% correct, but fixing those 1%s is where the fun happens in science. Einstein's insight was that the laws of physics are essentially the same everywhere. Wind the crank on this postulate and out falls General Relativity, an incredibly powerful theory that explains gravitation in terms of geometry. Geometry, which means literally "Earth measuring", is more than understanding circles and triangles on a page, though that will get you pretty far. But we know that when your surface is curved, like the Earth, you can run into trouble. For instance, my friend and I leave the cinema after a midnight screening of Pitch Perfect 2. If I go a km north and then a km west, and my friend goes a km west then a km north, chances are we'll arrive pretty close to each other, and can continue to sing the numbers in approximate harmony. But if we go much further, or do so near the poles, we're liable to get entirely lost and never see each other again. It turns out that measuring the distance between us after our respective treks, as a function of the directions we went and how far we went, is a good way to measure the curvature of a surface. Out in space, the universe is pretty 'flat', which is to say, Pythagoras' theorem works. Closer to Earth or some other massive body that warps space, you need to tweak the theorem a bit to make it consistent. The little factors you add, for instance to the vertical direction, can be converted into curvatures, and vice versa. But it turns out that if you wobble these numbers in just the right way, they keep wobbling, forming a wave that propagates through the universe at the speed of light. This is a gravitational wave. Gravitational waves are not the same as gravity waves. Ocean waves are an example of gravity waves, where the restoring force is buoyancy and gravity. They are not difficult to detect. Gravitational waves move through space and time (which us technical types call spacetime) and subtly shift the distances between things back and forth as they pass. Which is how we try to measure them. 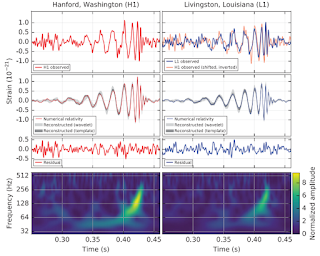 Since the late 1980s, a herculean effort by thousands of mostly NSF-funded scientists has resulting in the building of the Laser Interferometer Gravitational Wave Observatory, or LIGO. This antenna, and a few similar versions around the world, is designed to measure gravitational waves as they pass through the Earth. When I first read about LIGO, in Scientific American way back in the 90s, I thought it rather a lot of effort. A powerful and very fancy laser shoots a beam into a beam splitter which sits at the junction of two 4km-long arms, each with mirrors on each end. Lots of other fancy stuff, other mirrors, etc, are involved. When the mirrors are correctly positioned, the reflected laser light interferes destructively and a nearby light sensor sees nothing. If the mirror is moved by a passing wave, the light doesn't cancel out as well and we see a fringe shift and can detect the passing wave. Of course, lots of other things move the mirrors too, including cars, planes, lightning strikes, waves crashing on the beach, earthquakes, etc, so the entire set up is suspended by seven levels of active and passive seismic isolation, and kept in a vacuum pumped down to <1 micro pascal, which is, I think, a better vacuum than interplanetary space. I was lucky enough to visit LIGO in Livingstone, Louisiana, in 2013. Some photos from the trip can be seen here: https://picasaweb.google.com/105494084231616659850/Louisiana2013 . There is another LIGO in Hanford, Washington, a pathfinder instrument at Caltech and in Western Australia, and similar observatories in Germany, Italy, and Japan, with one planned in India. When these are all up and running, we'll be much more capable of localizing the position of sources much more accurately. The reason you need such a staggeringly complicated instrument is that spacetime is stiff. Stiffness means how much it warps in response to a force. It's much easier to shake a piece of string than a heavy rope, and spacetime is the ultimate heavy rope. Whirling masses around like poi might generate a gravitational wave, but it's much too weak for the mirrors of LIGO to see. Even though LIGO can sense a strain of one part in 10^21, you need very dense objects moving very close to each other and very, very fast. The best candidates for signals are binary neutron stars and binary black holes, about which more later. The first LIGO runs were completed in the 2000s, when the instrument was in its initial and enhanced phases, and they detected ... nothing. Except a deliberate (fake) injection in 2010. This was expected - the first phase was designed to inform the design of the second phase, which was built between 2010 and 2015. Then, on September 14 2015, during an engineering shakedown commissioning run, both detectors saw this astonishingly powerful signal, visible in the data to the naked eye, almost as soon as the instruments were turned on. The intervening 5 months were spent looking for mistakes, other noise sources, running veto checks, waiting for something to go wrong. The signal was verified, and the papers published. In the meantime, of course, about 1000 scientists had to keep it a secret, which they mostly did. The field has a not-entirely-undeserved reputation for publishing first, peer reviewing second, and retracting third. Just in 2014, another group had claimed detection of gravitational waves from the big bang, imprinted in the cosmic microwave background, but had to later retract the discovery. The existence of gravitational waves had been previously indirectly inferred by the orbital decay of binary pulsars, but September 14 was the first directly detected gravitational wave, and it was a humdinger, as you can see in the image below. In the above image, taken from the primary paper, you can see the signals reach the blindingly powerful strain of 10^-21. Which means that the mirrors moved by about a thousandth of the width of a proton, which is a million times smaller than an atom. Not bad for a system made of atoms and measured with discrete photons of light with a wavelength of a mere 10^-6m. During the last tenth of a second of the black holes' separate existence, they emitted a lot of energy as gravitational waves. The equivalent of 3 solar masses worth, to be precise. This is also an incredible amount of energy. For that tenth of a second, the black hole binary dissipated more energy than every star in every galaxy in the entire visible universe. 50 times more. If that energy were in the visible electromagnetic spectrum, instead of gravitational waves, it would (briefly) be brighter than the full moon, despite being more than 50 times as distant than the Andromeda galaxy, the most distant object normally visible to the unaided eye. Already, we know far more than we ever did before. Black hole binaries exist - and might even be common. Intermediate black holes, in the 10s of solar masses, exist! Perhaps they originated from earlier mergers, perhaps from single older massive stars with low metalicities. Metals, generated in the cores of dying stars, make second generation stars significantly less transparent and limit how much mass is left over to form a black hole. There are almost certainly more signals in this, the first science run of Advanced LIGO. Up until now, everything we know about our universe (except for a few stray neutrinos) we have learned using electromagnetic waves - light, radio, x-ray, gamma rays, microwaves. As of 2016, humans can now hear the universe as well as see it, showing us all kinds of things that are there, even if they don't glow. We are sure to be in for some surprises. No blog of this length would be complete without a mention of the founders of LIGO. Three venerable academics can claim that title, all still alive and, to an extent, kicking. Kip Thorne, the executive producer of Interstellar and professor emeritus at Caltech, Rai Weiss, of MIT, and Ron Drever, who built the 40m prototype, are names you may hear later this year in connection with a royal trip to Sweden! Some of my readers may be familiar with my own doctoral work at Caltech, where I was part of the numerical relativity group. My own infinitesimal contribution concerned one aspect of producing simulations of binary black holes, which we use to help detect, and then back out the physical properties of the signals we detect. I don't think my research was used in this particular detection, but if I discover otherwise I'll certainly update this blog! Perhaps you want to know more? One positive trend in science is the open access movement, whereby publications pertaining to publicly funded research are made publicly available, instead of by subscription only. Physics is generally ahead of the curve in this respect, and all of the (15ish) papers, data, and data processing software related to this discovery is freely available online. Papers 100-113+ on https://www.lsc-group.phys.uwm.edu/ppcomm/Papers.html, click the ArXiV link in the 5th column, download the pdf. I'm not the first, only, best, or most handsome scientist to also blog on the topic. Here are a few others, often focusing on different aspects of this incredible discovery. Blog by John Preskill, another Caltech professor. Blog by Roger Blandford, a professor at Stanford and occasional coauthor of Kip Thorne. Blog by Mark Hannon, a professor at Cardiff.